For many, the periodic table has been that complicated chart you had to memorize in high school or something only scientists deal with in daily life. While the periodic table we are all familiar with was formulated by Russian chemist Dmitri Mendeleev in 1869, the ideas behind it began formulating 200 years earlier and almost another 150 years later, the template it created is used in various designs from artistic visions to organizing candy. The periodic table is a chart that organizes chemical elements based upon their electron configurations, atomic numbers and recurring chemical properties. What does this mean to the average layman? Basically, the table groups elements together based on similar and increasing/decreasing properties or characteristics and allows scientists to predict where the elements we have not yet discovered will fit in once we do. While many elements have been known since ancient times, such as gold, silver, zinc, platinum and tin, many have only been discovered in the last 100 years, and we keep discovering new ones. The table makes it easy to place them with elements that share identical periods (same number of atomic orbitals) or in groups (same number of electrons). There are currently 118 elements on the periodic table. If that sounds like a lot more than you thought, it’s probably because elements get added all the time. In fact, it was only in December of 2015 that the four latest elements were accepted by the International Union of Pure and Applied Chemistry – numbers 113, 115, 117 and 118. Their names? Ununtrium, ununpentium, ununseptium and ununoctium. I kid you not. All each one of the current names means is its number in the Latin language – they are nothing but temporary placeholders, until proper names have been devised for these elements. It’s usually, names inspired by scientists or science institutes. Like Einsteinium ( Es ), named after Albert Einstein, or Californium ( Cf ), with atomic number 98, which was named after the State where it was first created – the University of California Radiation Laboratory, in Berkley, 1950. Up to the year 1500, only nine elements were known, eight of which had been known since ancient times. The human body is mostly made of 10 out of these 118 elements, with tiny traces of another 10. The rest of them are altogether different stories. Some cannot even be found in nature, although it’s been proven that they once existed. 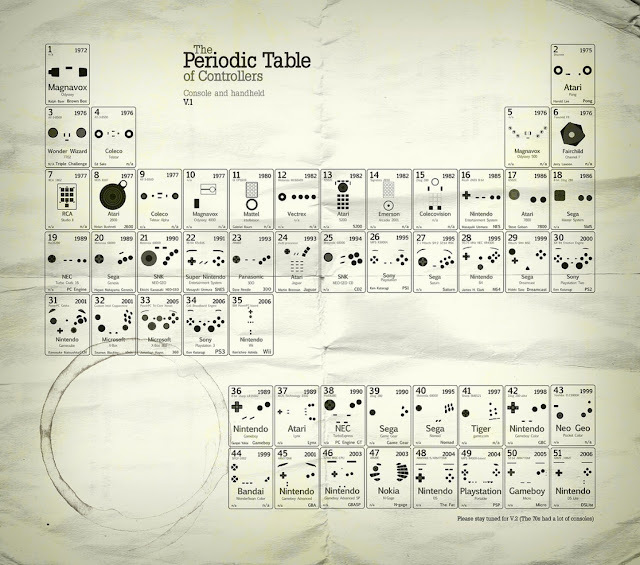 It all gets very complicated, but it is the format and creation of this table has led many much more fun periodic tables, from alternative arrangements of the original, to periodic-table inspired miscellany. Which was only to be expected: After all, such a useful and iconic tool can only breed imitations, spin-offs and parodies. 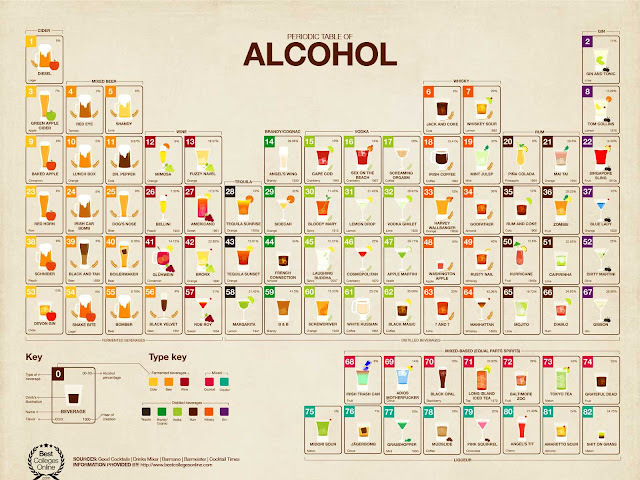 While it may sound amusing, Best Colleges Online commissioned the Periodic Table of Alcohol as a learning tool for anyone who’s new to drinking. While a lot of people may enjoy the odd drink or the weekend party, many have no idea what exactly they are imbibing. So it is actually meant to promote responsible drinking. The chart was created to group alcohols together by base: cider, mixed beer, wine, tequila, brandy, whiskey, rum and gin. The ABV is also given for bases and cocktail so as to educate on each drink’s effect on blood alcohol level and enable anyone to calculate their consumption and make sure they don’t overdrink. Created by wine connoisseurs De Long, the Wine Grape Varietal Table lends a little more class to the world of imbibing decadence. 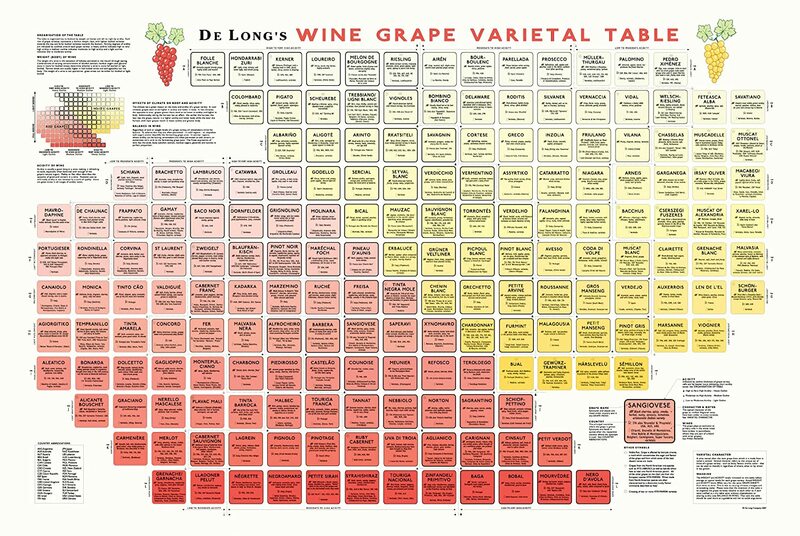 It groups varietals of grapes with fermenting processes. Reds, white, roses, sparkling, sweet and other families and types of wine are grouped in rows while stainless steel tank versus barrel-aging are given columns. Even the type of barrel wood or temperature range in the stainless tank is considered. 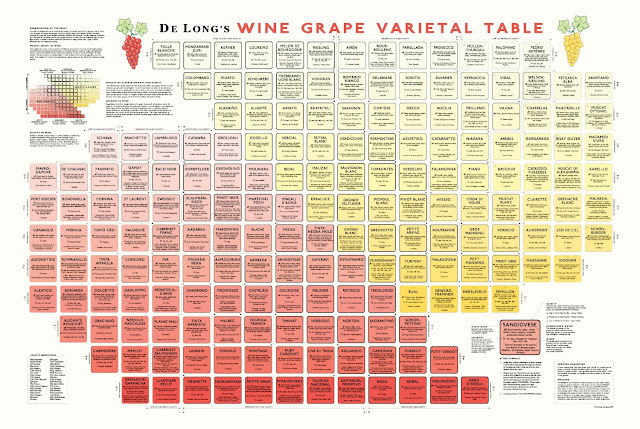 The poster also makes a lovely piece of art for the wine lover. Periodic tables of food can be found online and at many restaurants, bakeries or gourmet food shops. The Periodic Table of Desserts contains rows and groups similar to the periodic table of elements, only referencing everyone’s favorite part of the meal. The groupings are based on thermal spectrum and structure, which sounds a little specialized, but even the layperson can tell what the column of sweeteners (sugar, maple syrup, honey and molasses) or row of nuts (pecan, almond, pistachio and so on) represents. The periodic table of condiments is helpful in that, based on ingredients; it gives information on the life expectancy of any sauce, spice, vinegar or seasoning. The periodic table of sandwiches organizes by meats, breads and condiments. 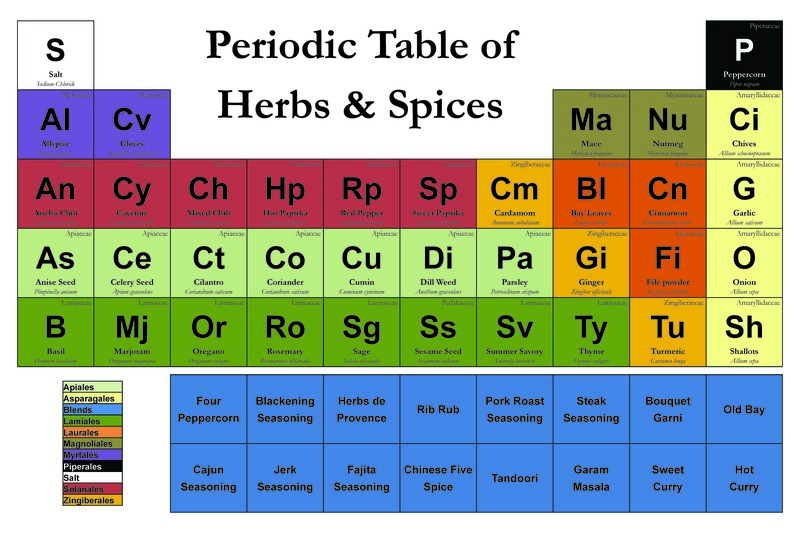 The table for herbs and spices or fruits and vegetables often groups in Latin categories just to look more interesting. Just about any food group can be found on one or another various periodic table of food. The arena of gaming is another popular place for periodic tables. The Periodic Table of Poker was created by online poker room PokerStars to help newer players become more comfortable with the terms, language and strategies of the often-daunting game of poker. Each column breaks popular poker terms into categories so it becomes easier to use and understand the terms. Some of the techniques can be useful if you want to advance your game, or you’re just wondering what your poker-loving friend could have meant by “open-ended straight draw”. In any case, just like all of these, a great visual representation. The Periodic Table of Game Controllers is educational in its groupings as well. There are handheld and console groups. There are columns or rows with brand names and Bluetooth versus hardwire, going back all the way to 1976. It contains quite a bit of info for the average online video gamer. 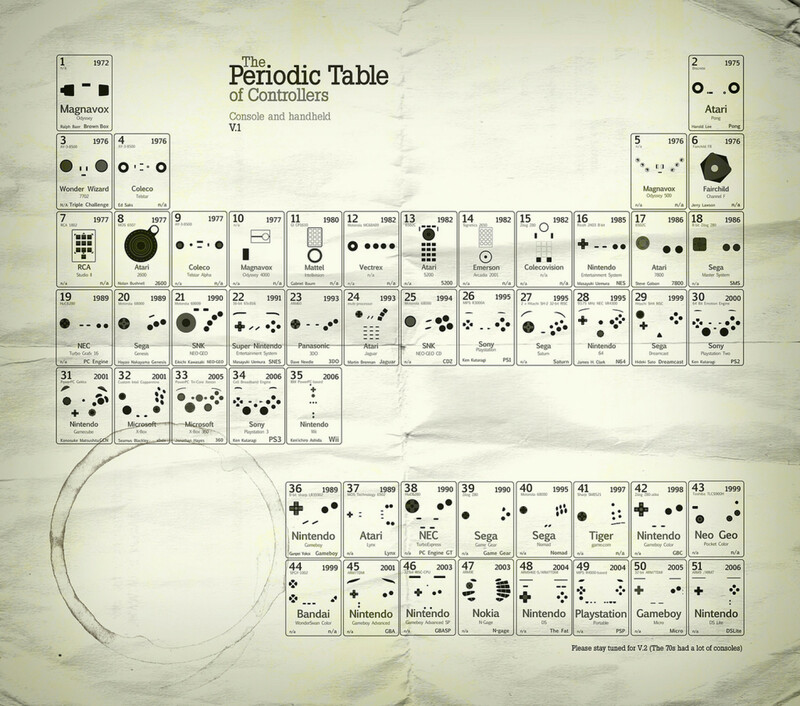 In fact, there are several periodic tables created for video games: characters, console manufacturers, game developers and more. Some are created at the level of an elementary student learning about oxygen and some are more for the genius needing a laugh. 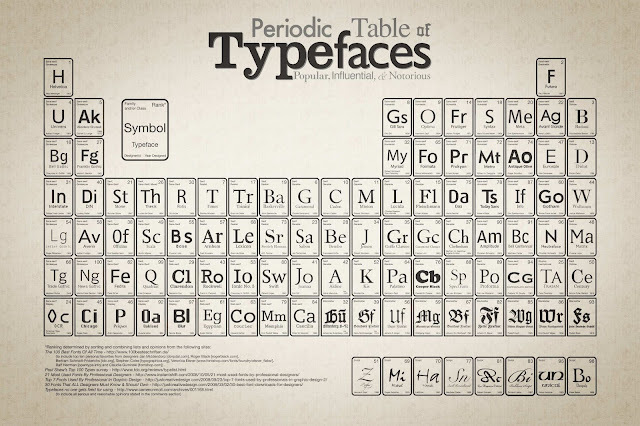 One of the more popular periodic tables seen on posters in many office supply stores is the Periodic Table of Typefaces, created by graphic designer Cam Wilde. 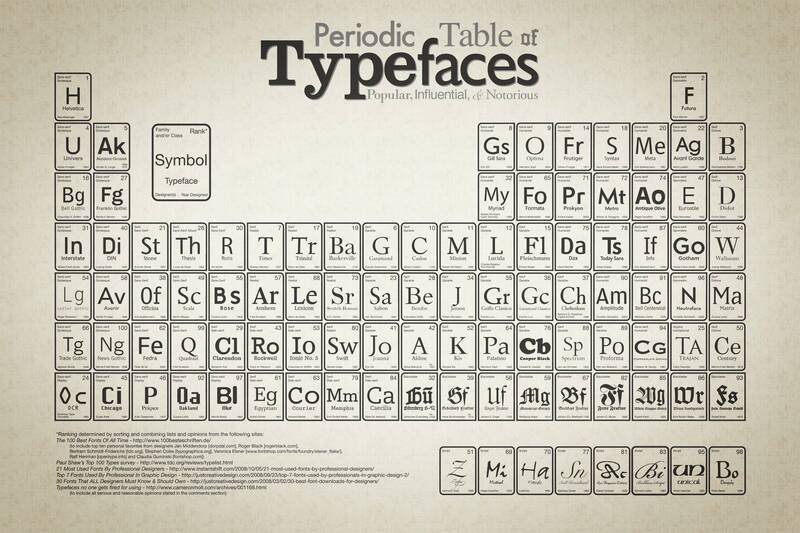 The table lists the 100 most popular, influential and notorious typefaces of all time. Like traditional periodic tables, families and classes of typefaces are grouped: script, sans-serif, realist, blackletter and more. They are also given a ranking depending on the number of lists the typeface appeared on. Interestingly, the creators favorites receive a special ranking on the table. It seems that, for the most part, the parodies of the Periodic Table of Elements have all been created to combine a little education with a specific presentation. Many have been made into lovely works of art, almost as beautiful as the elements themselves. 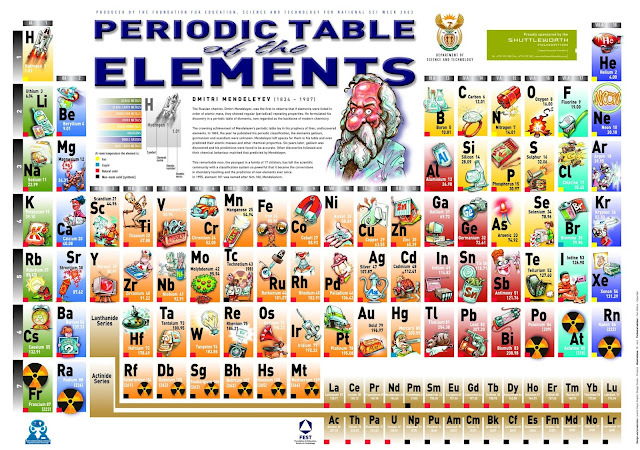 Posters, paintings and pictures of various periodic tables can be found online or at quaint boutiques on the wall. The table has become art itself, which of course means alongside the multitudes of tables to be found, there must also be a Periodic Table of Art!